11:27 AM Posted by Tony A.
Ferrari Formula 1 design. 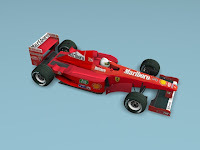 Simple touch of racing car for gaming resources. With smooth lines makes your design more real.Download and enjoy.